Brilliant Group of Technical Institutions, Ranga Reddy has advertised for the recruitment of Teaching Faculty- Professor / Associate Professor / Assistant Professor / Principal Plus Non-Faculty jobs vacancies. Interested and eligible job aspirants are requested to walk-in on 20th, 21st and 22nd November 2018. Check out further more details below. About College: Brilliant Group of Technical Institutions encompass 3 Engineering colleges along with MBA Courses in 2 colleges and Pharmacy course in one college. The colleges are approved by All India Council for Technical Education (AICTE), New Delhi, Pharmacy Council of India (PCI), New Delhi and are Affiliated to JNTUH, Hyderabad. It also has Polytechnic course in all the 3 colleges which are approved by "State Board of Technical Education and Training (SBTET). 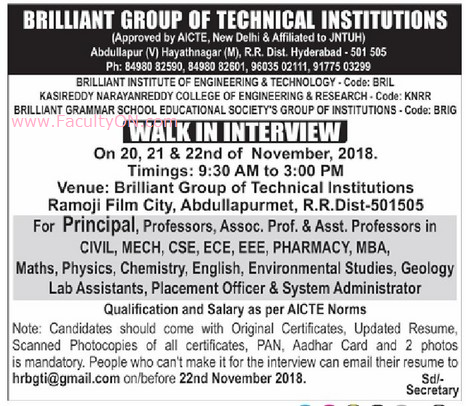 Brilliant Group of Technical Institutions is sponsored by Brilliant Grammar School Educational Society (BGSES), Abdullapur (V), Abdullapurmet (M), R.R. Dist., Hyderabad. How to Apply: Interested and eligible candidates are requested to attend the Walk-in interview along updated Resume, original certificates, scanned photocopies of certificates, PAN card, Aadhaar card and 02 recent passport size photos to the walk-in address given below. People who can't make it for the interview can email their resume to the email address on or before 22nd November 2018. Land mark: Near Ramoji Film City.